After a glorious 1980s and 90s as the pin-ups of total synthesis, it seems that the macrolides are now pass?, and all the cool kids have moved on to work on alkaloid natural products. Several exceptional syntheses of this huge class have been published in the past few years, using biomimetic principles to inform retrosyntheses. Of course, nature’s toolkit contains a bewildering array of enzymes, capable of perfect stereochemical control and chemoselectivity - something we’re still a long way off - but the intermediates and strategies are often ideal starting-points. 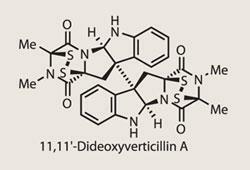 The starting point for Movassaghi was the construction of the titular diketopiperazine, they used simple amino acids to provide a pair of stereocentres, one of which links to a protected indole. Adding elemental bromine forms a bromonium ion on the indole, onto which the piperazine cyclises, giving the tetracyclic monomer with a synthetic handle in the form of the remaining bromide (figure 1). Following on from this success is yet another extraordinary transformation, the group using an even more esoteric reagent to perform four oxidations. Of course, as a dimeric compound the symmetry means only two environments exist, both of these rather similar C-H bonds, in fact. So now all the group had to do is find the perfect reagent to chemoselectively oxidise a C-H bond to an alcohol - no mean feat. The key to their success was a careful examination of the bond strength, and their realisation that the homolytic bond enthalpy is actually quite small. Before you grab your copy of McMurry, I’ll refresh for non-radical chemists - this refers to the dissociation of the bond to give two radicals, rather than an anion and cation. 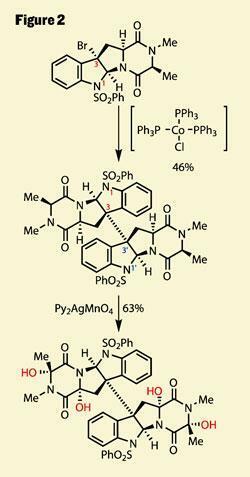 Thus, by using a radical oxidising agent, they were able to target these four weak bonds and achieve an astonishing chemoselectivity, as well as stereoselectivity. Some more routine protecting group chemistry gives the neurons a brief break, before Movassaghi performs a tour de force to complete the target - involving more intermediates than I have space to draw. Again, a careful examination of the intermediates’ sensitivity to various conditions leads to a crucial understanding of how they might proceed. The inclination of the freshly installed hydroxyl groups to displace or eliminate was evident, and treatment with potassium trithiocarbonate brings about the loss of all four to form a pair of bridged piperazines (figure 3 - the bridging group in this case is a dithiepanethione, shown in shorthand as a red curve as I can’t fit it in full). Looking remarkably like the row-three equivalent of a carbonate, this group is clearly ready to rearrange or eliminate, which the group achieved by adding ethanolamine. In a short cascade, this formed a tetrathiol, which after treatment with potassium iodide snapped shut to give the desired disulfides and the target. 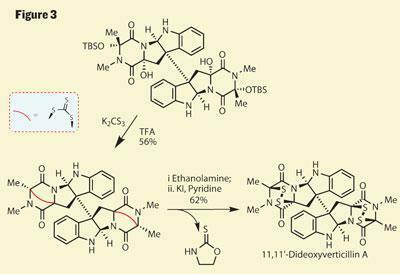 It’s rare that a synthesis comes along and checks all my boxes: neat target; useful biological activity; short, efficient synthesis; interesting reagents and mechanisms; and crazy-looking intermediates - but this paper has them all. A strong candidate for my synthesis of the year, and it’s only April!